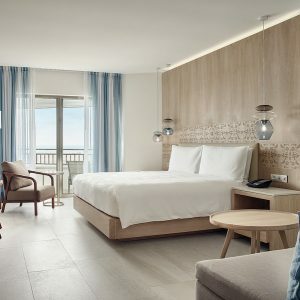 JW Marriott, part of Marriott International, Inc., today announced the completion of JW Marriott Cancun Resort & Spa’s highly anticipated renovation, which includes an extensive transformation to all 447 lavish ocean-facing guestrooms and suites. The hotel’s multi-million-dollar restoration will provide travelers with the highest degree of luxury service, embracing its ideal beachfront location and introducing modern elements complemented by local Mayan flair. Designed to meet the expectations of next-generation leisure travelers, the hotel’s exclusive and updated Club 91, located on the 14 [th] floor, evokes a mod-style that sets the scene for relaxation and socializing. The inviting new space boasts navy blue and olive-hued chairs in combination with coral reef ceiling décor, providing guests with a glimpse into what lies beyond the hotel’s shores. Club 91 also showcases exciting new interactive culinary experiences and open communal table concepts, encouraging guests to mix and mingle. About JW MarriottJW Marriott is part of Marriott International’s luxury portfolio and consists of beautiful properties and distinctive resort locations around the world. These elegant hotels cater to sophisticated, self-assured travelers seeking The JW Treatment® – the brand’s philosophy that true luxury is created by people who are passionate about what they do. JW hotels offer crafted experiences that bring to life the brand’s commitment to highly choreographed, anticipatory service and modern residential design, allowing guests to pursue their passions and leave even more fulfilled than when they arrived. Today there are over 80 JW Marriott hotels in more than 25 countries and territories. Visit JW Marriott online, and on Instagram, Twitter and Facebook. JW Marriott is proud to participate in the company’s award-winning loyalty programs – Marriott Rewards®, The Ritz-Carlton Rewards®, and Starwood Preferred Guest® (SPG). The programs, operating under one set of unparalleled benefits, enable members to earn points toward free hotel stays, achieve Elite status faster than ever, and seamlessly book or redeem points for stays throughout our loyalty portfolio of 29 brands and more than 6,700 participating hotels in 129 countries & territories. To enroll for free or for more information about the programs, visit members.marriott.com. About JW Marriott Cancun Resort & SpaThe landmark JW Marriott Cancun Resort & Spa offers an unforgettable Cancun vacation, featuring 447 luxury rooms and suites, each equipped with private balconies that showcase views of the Caribbean Sea. For those who wish to indulge themselves, Club 91 offers the sophistication and exclusivity of a private club, with access to the resort’s full range of luxury amenities and services. The JW’s Mayan-inspired spa is rated one of the top spas in Mexico and offers massages, body wraps, manicures, pedicures and more. With world-class restaurants, expansive meeting space and the stunning beauty of the Mexican Caribbean, the JW Marriott Cancun Resort & Spa is an ideal choice for corporate retreats, events, romantic getaways and family vacations. For more information or to book a reservation, please visit www.jwmarriottcancun.com or call 1.800.223.6388.